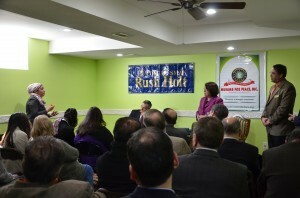 Muslims for Peace held its first Q&A/meeting with Congressman Rush Holt, Senator Linda R. Greenstein (D) (Assistant Majority Leader), Stephen Dalina (Councilman) at private gathering in Monroe Twp, NJ on Sunday February 26th 2012. The session focused on the ongoing human rights violations in Bahrain and Associated Press reported that the NYPD put American citizens under surveillance and scrutinized . “With nothing but unfounded and biased suspicions, the NYPD has sent agents far and wide to collect information that will be of no use except to make people feel intimidated in their home communities. Mayor Bloomberg and the NYPD should never have done it, and Gov. Christie and New Jersey law enforcement should not accept it.” Congressman Rush Holt made statement on NYPD issue. On Bahrain “The violent crackdown by Bahrain’s government against citizens seeking genuine democratic reform was inexcusable. The continued detention of activists, the suppression of independent media outlets, and the failure of Bahrain’s monarchy to expand political freedoms have all been raised repeatedly with Bahrain’s leaders by human rights organizations and members of Congress, including me. I strongly support the democratic aspirations of Bahrain’s citizens, which is why I am a co-sponsor of H. J. Res. 80 offered by Rep. Jim McGovern of Massachusetts, which would condition future U. S. arms sales to Bahrain on the implementation of significant political reforms.” Congressman Rush Holt made statement on Bahrain issue”. The following speakers were featured in the panel: Nada Alwadi (Bahraini Journalist), Dr Asad Sadiq (Chairman MFI ), and Naqi Haider (Executive Director MFP). 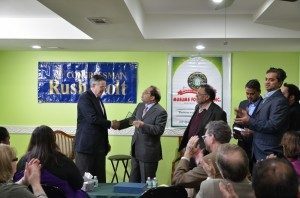 The audience of approximately one hundred individuals included professionals such as senior congressional staffers, leaders of various community members , journalists, and concerned U.S. citizens.